Come and experience ... 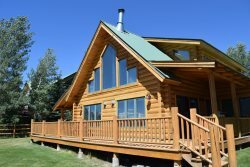 PURE LUXURY, ECO-FRIENDLY BUILDING, SUPBERB IN-TOWN LOCATION, GREAT CRAFTSMANSHIP & the BEST VIEWS IN THE BUTTE!!! Being our guests you will be dazzled by SPECTACULAR, UNCOMPROMISED VIEWS of towering Mt. Crested Butte, Paradise Divide, Mt. Emmons, Whetstone, and Maroon Bells as well as the historic Kupushion barns. The living room is outfitted with the latest home theatre system, flat screen TV, cable television, FAST WIRELESS INTERNET, and a cozy fireplace. Off the living room is the deck for catching some rays and admiring the beautiful views. The upper floor also has a bedroom with 2 twin beds (can be made into a King) and a custom slate tiled bathroom with shower. The lower floor has a beautifully furnished and inviting queen bedroom with a pillow top mattress, 600 thread Egyptian linens, down comforter and pillows, and an exquisite Asian influenced travertine bathroom with big-fluffy towels and a STEAM SHOWER. Facing the amazing view of 180 degrees of mountains you can dine and relax on the outdoor patio complete with a Weber BBQ perfect for summer grilling, log double bench, teak wood table and chairs, and a big red market umbrella.